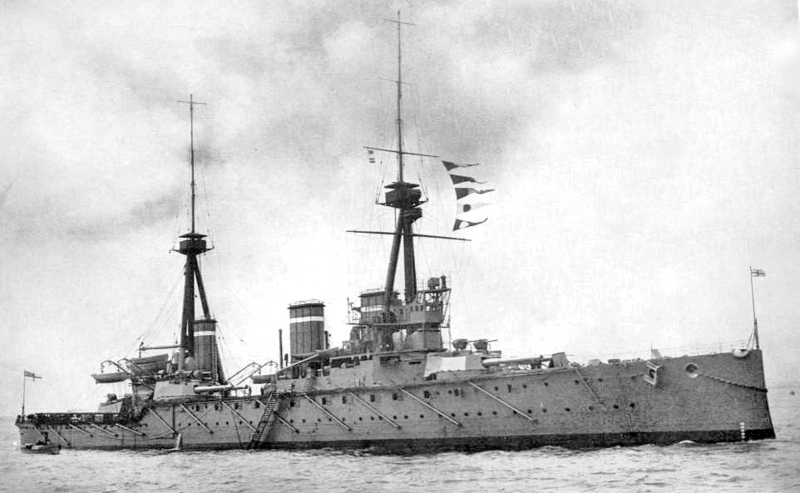 Was classified as a armoured cruiser till Admiralty reclassification in 1911 (24 Nov). Magazine explosion after Q turret was penetrated around 18:30 when she appeared as a clear target for Derfflinger and Lützow. Three salvos in 90 seconds finished her. One 12" shell from the third salvo hit midships Q turret. The shell penetrated the turret, blew the roof and the magazine, splitting the ship in two. Six survivors from the magazine explosion - Commander Herbert Dannreuther, Lt. Cecil Sanford, CPO P T I Thompson, Yeoman of Signals Walter Maclean Pratt and gunner Bryan Gasson RMA. Carried 2,997 long tons of coal and 738 long tons of oil , used to spray on the coal to increase burn rate. Could cover 3,090 nm at 10 knots. Four shaft Parsons direct drive steam turbines, 31 Yarrow boilers giving 41,000 shp. Each Parsons was installed in a separate engine room. 7" (178 mm). Turret roof was 3" of Krupp non cemented steel. Gunnery system was so bad that she had to have refits in 1909 and 1911. She was converted to hydraulic power finally in 1914 at a cost of £151,200.